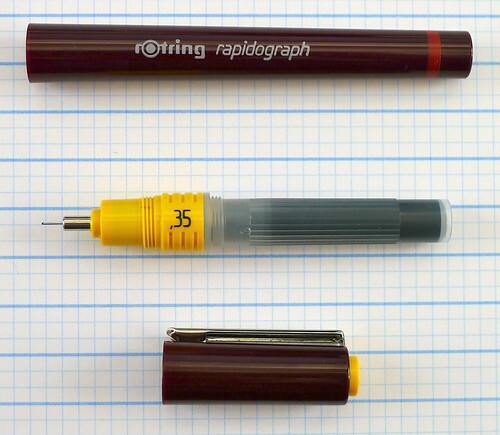 I need to go ahead and get a few things out of the way up front about the Rotring Rapidograph. This is not a pen for everybody. It is a very technical pen both in design and performance and is best suited for those who know exactly what they are getting into when purchasing. Do your homework before buying. Hopefully this review will help in that aspect. It must have been 20 years ago when I bought my first technical drawing pen. I loved the idea of an extremely fine needle tip, and the fact that it came with a bottle of ink to refill it was a bonus. In retrospect, I had no business buying that pen. I didn’t treat it properly and it clogged up and stopped writing before I knew it. It sat unused in a desk drawer for years before I finally tossed it out in frustration. Fast forward to today and the lure of the technical drawing pen grabbed me again when JetPens started stocking the Rotring Rapidograph. With 15 different tip sizes I settled somewhere in the middle and went with the 0.35 mm. You all know I am not an artist but I like my fine lines, so I wanted to see what this pen could do. When I first unboxed it I had to read the instructions to ensure I was putting it together correctly. It is not difficult by any stretch - I just wanted to do it right. You should do the same with all of your pens to ensure the best performance. Once I put it together it started writing immediately. 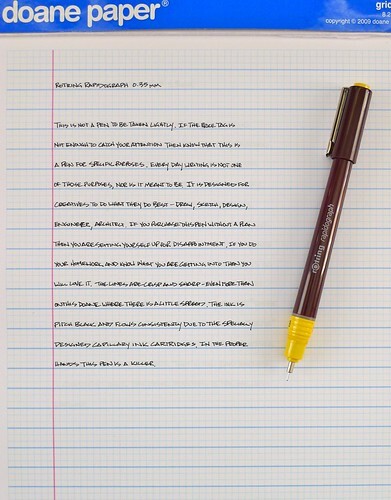 The first thing to note is that this pen does not glide across the page like a gel roller. Then again, it is not designed to. The tip is very fine and very strong but there is some scratch feedback when writing. That is an acceptable fact for all technical drawing pens. 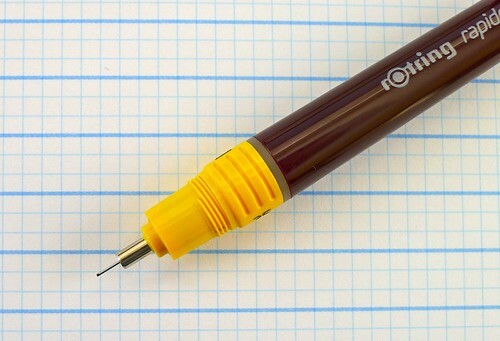 Another trait the Rotring Rapidograph shares with similar pens is liquid ink. That means it will bleed on some types of paper. This goes back to my previous statement on knowing what you will be using this pen for before purchasing. You need to keep the type of paper you use in mind. This is not a cheap pen, but it is designed to last. It is refillable with an innovative capillary cartridge system. With each refill, the pressure-equilization system ensures the ink flows cleanly, quickly, and reliably. I haven’t had to refill mine yet but have never had an ink flow issue even if the pen sat unused for a week or two. All in all, I am very happy with my Rapidograph. While I may not be using it to its fullest potential I enjoy it every time I pick it up. If you know what you are getting in to and do your homework you might like it too. Posted on March 19, 2012 by Brad Dowdy and filed under Pen Reviews, Rapidograph, Rotring.